Four weeks ago I had Coolsculpting* at Hampton Clinic. You may have seen snippets of my treatment on my Insta stories. I want to tell you about my experience and I've had lots of questions about the treatment itself so I'll talk you through it and hopefully I'll answer all of them for you in this post. It's a long one mind! First and foremost it is NOT a weight loss treatment. 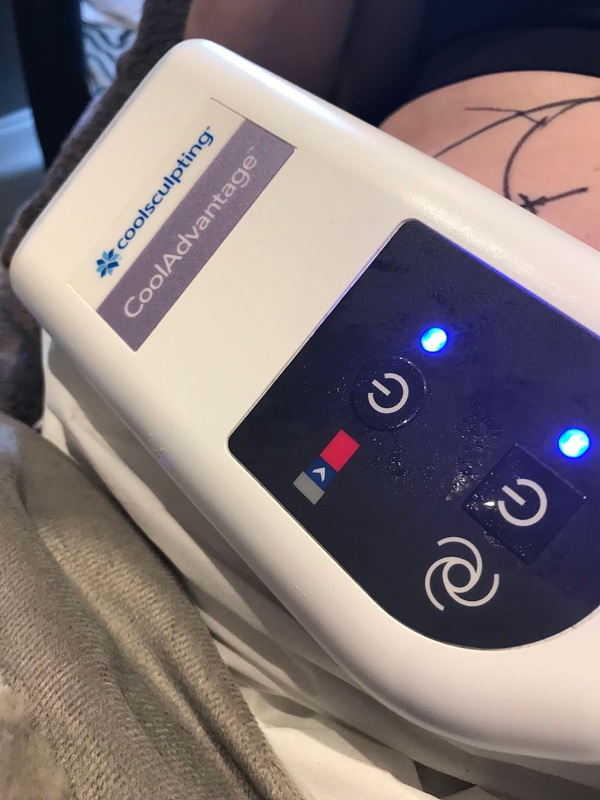 CoolSculpting is an innovative way to target stubborn areas of fat, by freezing away fat cells, permanently and safely. It's also known as cryolipolysis and is the worlds number one non-invasive fat reduction treatment. Well, CoolSculpting uses controlled cooling to target and kill fat cells in specific areas of the body. The cells are frozen, then gradually die off and over a period of time leave the body through the body's own natural elimination process! There's no damage at all to the skin or the surrounding tissue and the untreated fat cells around the treated area remain unaffected. You don't see immediate results though. 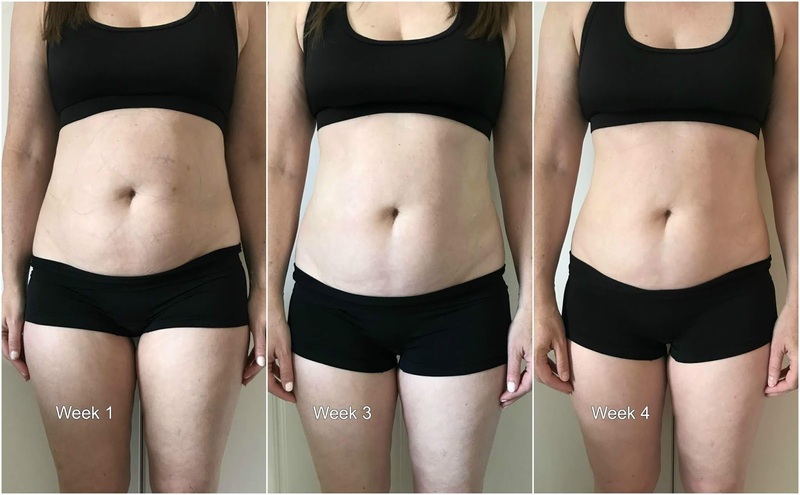 It starts working straight away and in the first 3 weeks the fat cells shrink but it will take a good three months to see the final results. I cannot stress how important it is to do your research, and then some more, before you book in for your treatment, but then you know that right?! I'm not just talking about this treatment either, I'm talking about any aesthetic/surgical procedure you are thinking of having and don't just research the treatment but the clinic AND the doctor too. Take your time and don't rush into anything. 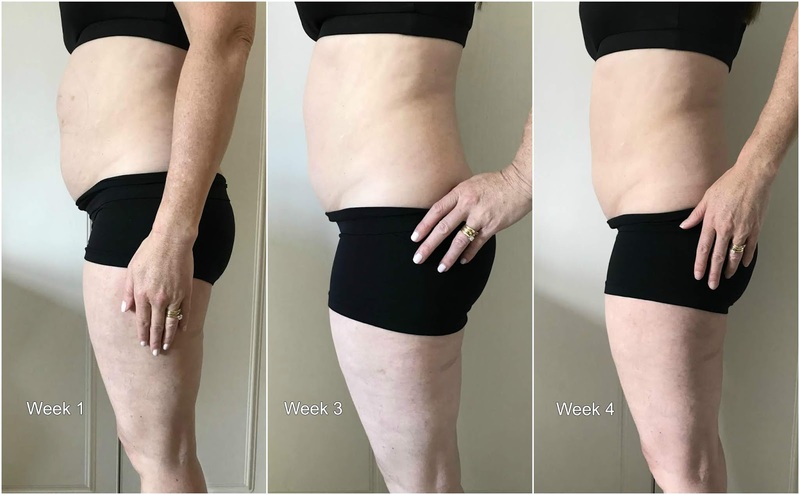 Dr Hill from Hampton clinic very kindly got in touch to offer me the CoolSculpting treatment in return for a totally honest and frank review with before and afters photos. I can't lie in that as soon as I heard the words 'fat reduction' I was immediately interested BUT I came home and did my homework and I thought about it for a very long time. 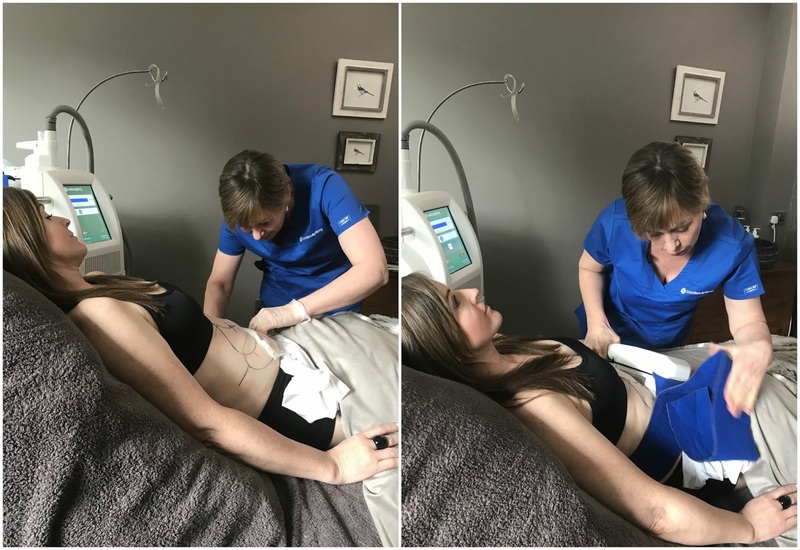 I had a hydra facial at Hampton Clinic in February (which was incredible) and from the moment I met Dr Hill and her team I knew I would be in safe and capable hands, of that I already had no doubt, it was just the CoolSculpting I had to be sure of. I read tonnes of reviews on line, and looked at many before & after photos on various websites until I was happy and confident to go ahead. Hampton Clinic offer advanced aesthetic skin and facial treatments and Dr Hill is a trained medical professional with 20 years specialising in General Practice and is highly qualified in all the latest treatments, in fact Hampton Clinic is the only clinic outside of London to rank amongst the top 5 for CoolSculpting. They are also SaveFace accredited which is a beauty standard to look for when you are choosing a clinic, all good practitioners will on the SaveFace register. I won't go into ALL the nitty gritty here because this will be quite lengthy anyway but basically I had an initial consultation with Dr Hill where she explained the procedure and assessed my suitability, yes, my stubborn belly fat was a good candidate!! We discussed all the in's & out's, facts & figures and what I could expect to achieve from the treatment. A date was then set. On the day itself I saw Dr Hill in the consulting room first to go over the treatment details once more and sign the consent. Dr Hill took photos at different angles for the purposes of my before & afters and marked up the areas to be treated. I was having four. I was excited but a little anxious too because I had read various reviews online where some people had said it was a little uncomfortable to some of them saying it was quite painful! 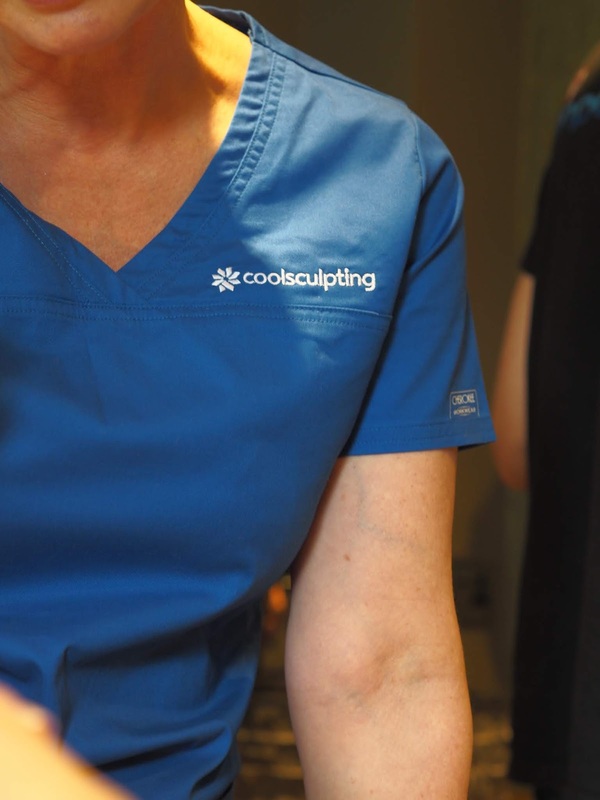 Once all that was done I was taken through to the treatment room where I was introduced to Karen, the CoolSculpting practitioner and I have to say she put me at ease straightaway, she was so lovely. Karen got me settled on the couch and then we began! The first area (my lower left) was cleaned and then a gel pad applied to my skin to protect it. 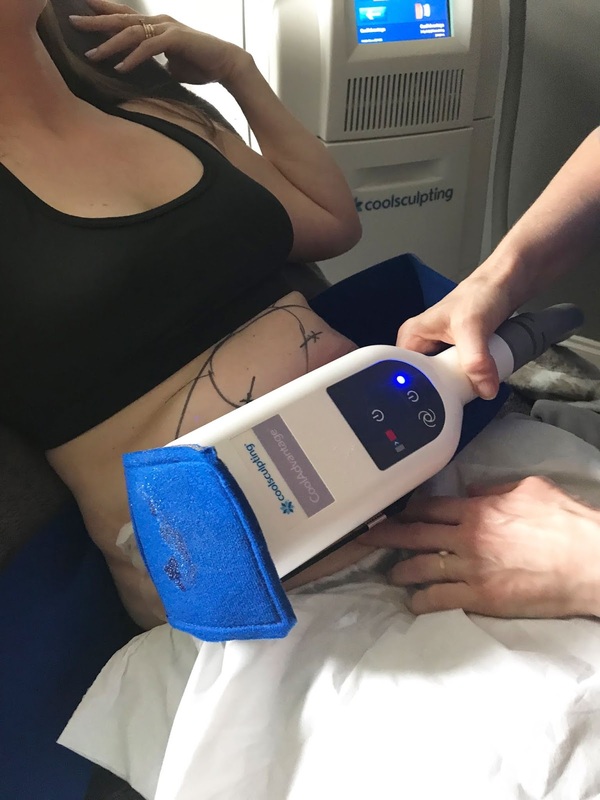 The CoolSculpting applicator was then placed on the markers and the suction turned on. The suction draws the skin and fat in and begins the freezing process, going down to minus 11 degrees. I could feel a slight pulling when the fat was sucked and drawn into the applicator and then felt the intense cold coming in, as it was freezing my fat down to minus 11 it became mildly uncomfortable but not painful, I could tolerate it no problem at all, it's all just a bit of a strange feeling and hard to describe really but honestly not painful. The freezing part lasted between 5-7 minutes, and then the discomfort subsided, those few minutes was as bad as it got in the first part because after that time the area went completely numb and I couldn't feel anything. The timer on the machine was set and I was left to relax with a coffee and a magazine for the next 30 minutes. I was completely comfortable and settled, think I even dozed off at one point! Karen popped back in to check on me a few times during the 30 minutes and then when the first cycle was finished she came back in to free my belly from the machine! It felt a bit stingy, the area was numb and very red and very cold. You know when you've been out in the winter for a long period of time, you touch your cheeks and you can kind of feel it but you can't, it's a bit like that, if that makes any sense at all!!! What followed next was a two minute massage. One minute of vigorous massage and then another minute massage in the figure of eight. This is absolutely necessary to help break down the fat cells and it helps to improve the results. I said the freezing treatment itself is not painful, it's not, but this massage is a tad painful. I've read some reviews where people say that for them it was very unpleasant, really bad and even Karen said it makes some people feel a bit nauseous. I just took deep breaths, nodding my head when Karen asked if I was okay. I was fine and remember it's only for two minutes, so over in no time at all. One area down, another three to go. Treatment complete, my whole tummy was red and numb and slightly swollen but I was able to get dressed straight away. Karen went over the after care and do's & don't's, not that there's many don't's because you basically carry on as normal. You can resume your everyday activities, work, shopping, gym. There are some side affects to having this treatment but nothing to be worried about. 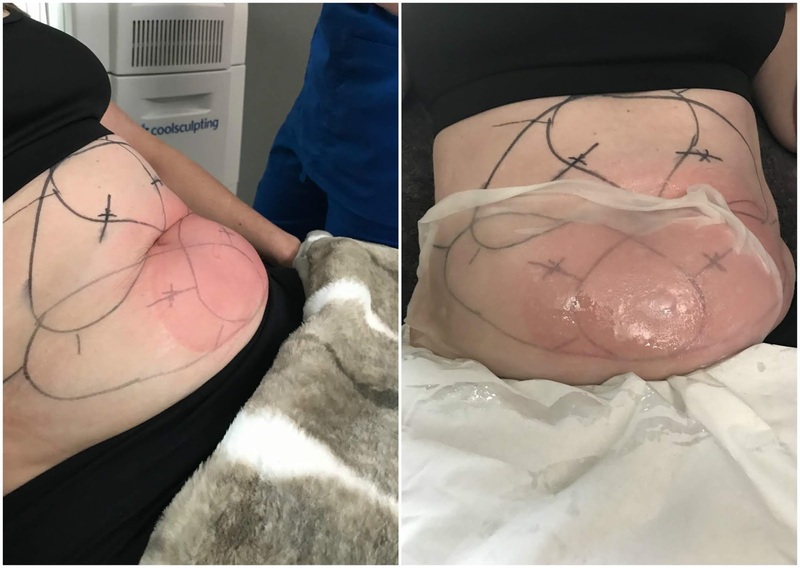 I've spoken about what you may experience during the procedure and afterwards [and into the following couple of weeks] the typical side effects include temporary numbness, redness, swelling, bruising, tingling, itching and tenderness. I experienced all of these, not all at the same time may I add. I took some paracetamol immediately after at the clinic and was told to take more later if I needed any, I didn't need any more pain killers at all. It is worth saying here that you can't take any anti-inflammatories after this treatment [and for the following 3 months] because it can affect your results. I'm not sure of the medical reasons why but your doctor will will go through all of that with you. Another thing I want to mention is that around 1 week post treatment I was getting, and the only way I can describe this is like teeny electric shock sensations under the skin, I know it sounds horrific, but nothing to make me jump around the place in pain, it literally was my nerve endings waking up after the freezing which I was told about and it only lasted 2 or 3 days at most for me. I think it was week 2/3 my skin was itchy too, like an itch you just can't get to and scratch and my skin felt quite dry. Slather on the moisturiser! At week 4 I do have the tiniest, and I mean the tiniest bit of numbness left, but that's apparently quite normal, it can last for a good few weeks for some people. It's more down the central part of my tummy and I think that might be where the applicator areas overlapped a little but it's wearing off more each day and doesn't cause me any issues. You're not particularly overweight. Why did you have it done? This is a question a few people have asked me and a good one. Remember this is not a weight loss treatment but fat reduction. I may not be overweight [although I've put on about a stone in the last year, I blame pre menopause] but after having two children I've had this pooch, and a bit of an overhang from two caesareans that I've never been able to get rid of, that muffin top, that spare tyre that's actually uncomfortable when I sit down. Yes, I've tried diet, yes, I've tried exercise but all the exercise in the world will never shift it. A lot of men and woman try all of that too yet still have areas of stubborn fat that will not budge regardless. I've actually spoken to a few people that are always at the gym and they still have issues with their tummy area! Some of you may wonder why I bothered, why not be happy with your body and just accept it the way it is, but we all have choice and this was mine, I chose it because the end result will make me feel more comfortable and yes of course, that will in turn make me feel more confident, so why not? Some people choose not to have their eyebrows done or their teeth whitened, or any other treatment for that matter, do we tell them that they should have that done? No, because it's personal choice. You've seen some of my before shots at the beginning so here are some after shots. I can see a real difference. What do you think? And, I'm only at 4 weeks so I can't wait for the 3 month shot. None on these photos have been edited in any way, shape or form. I wanted to show the real me, awful legs and all!! Treatment areas include thighs, tummy, back fat/bra fat, upper arms and under the chin. Apparently the only area that can't be treated is the bum. Damn! Actually, scrap that, I quite like my bum, needs a bit of work but I like it!!!! I think I remember Karen telling me that the area just underneath the buttocks [known as the banana roll] can be treated. Remember, there's no downtime, and it's non invasive with no anaesthetic involved. It's important to remember that everyone's different, every body is different and results may vary, but your doctor will discuss what you can hope to achieve at your initial consultation. I'm sorry this has been a very lengthy post but it had to be as I wanted to try and explain everything to you as best as I could and tell you about what I experienced afterwards and it needed to be in one post rather than break it down. I will be doing another post after three months with my final results and photos and I'm doing some Insta stories along the way too don't forget. Find me on Instagram here. 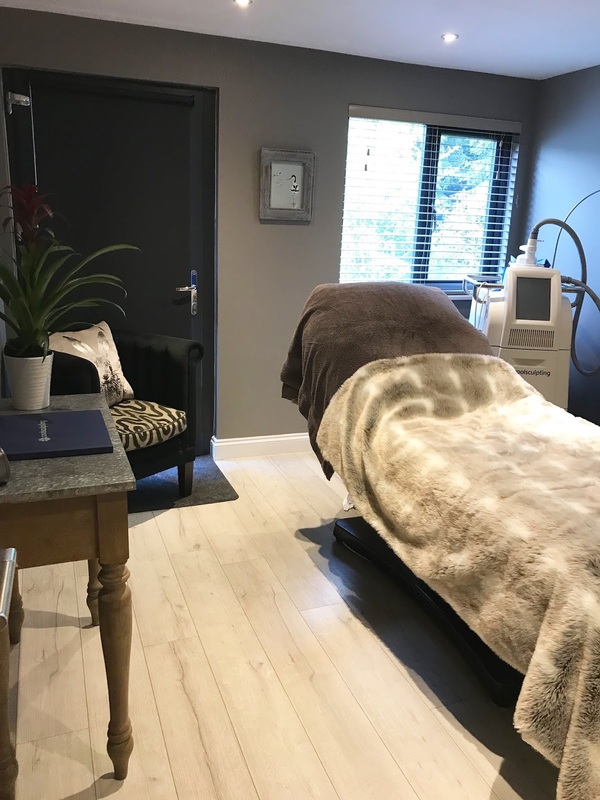 If you're interested in hearing more or there's anything you want to ask then please give Hampton Clinic a ring, they are so lovely or head to their Coolsculpting page which you find right here. I genuinely would recommend them to anyone, the clinic is easily accessible from the M42 and Birmingham airport as well, and it's set in the stunning grounds of Hampton Manor. I hope I've answered all of your burning questions but if there's anything else you want to know leave me a comment and I'll get back to you. *This treatment was offered in return for an honest review and all thoughts and views are my own.